1. Bees have been disappearing in record numbers since the proliferation of WiFi systems. 2. Shungite has demonstrated the ability to attenuate the destructive nature of WiFi signals. 3. Shungite also neutralizes toxins such as herbicides and fertilizers and radiation, which could also be killing the bees. 1. Determine the effects from Shungite being added to the beehive environment. 2. Establish "products" that are best suited and most efficient use of Shungite. Beginning 5/20/17 in an 11 week time frame, our first 2 hives went from 50,000 bees to an estimated half-million bees in a total of 6 hives and unknown amount of swarmed bees in the wild. There was also no disease, mites or Colony Collapse; although, neighboring apiaries reported both Nosema disease and Varroa mites. 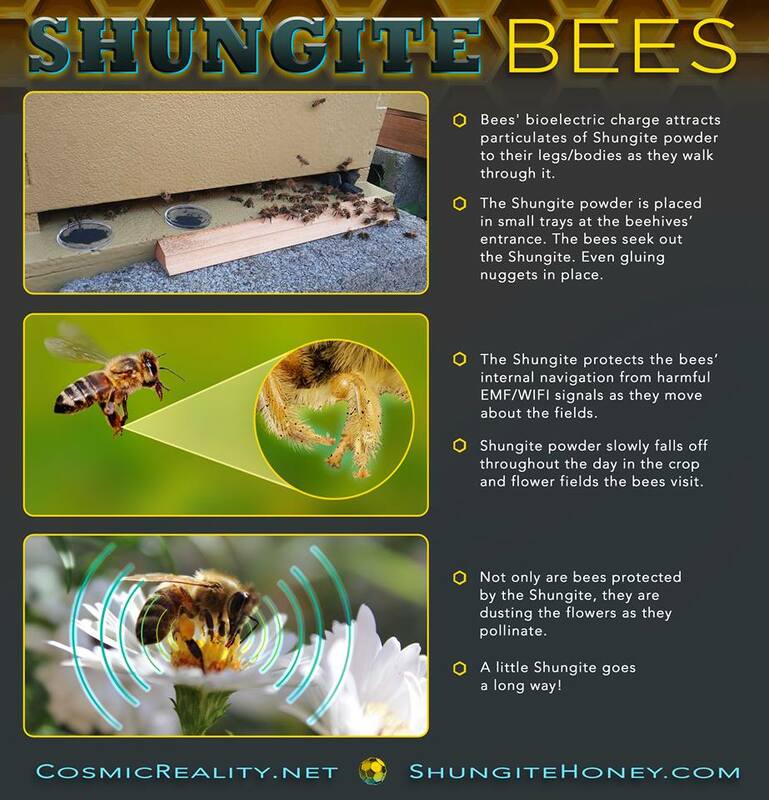 Derek and Maureen from www.ShungiteHoney.com heard our radio programs discussing Shungite and bees and began a research project. Within a month Derek was in contact with Cosmic Reality. His lone research project is blossoming into a concerted effort to see if Bee Colony Collapse can be eradicated. We initially solicited participation in further research by individuals running apiaries. With little response, we approached Universities and were told we had to provide documentation of our research, which we already had in the form of multiple websites, showing every phase of the project, but they didn't pay attention. Next we were contacted by larger apiary operations and nonprofit groups of which research is ongoing. The research will provide us with the most efficient and economical products to help save the bees. As soon as this data is available along with the products we'll make them available to beekeepers world-wide. WANT TO BE A BEEKEEPER? 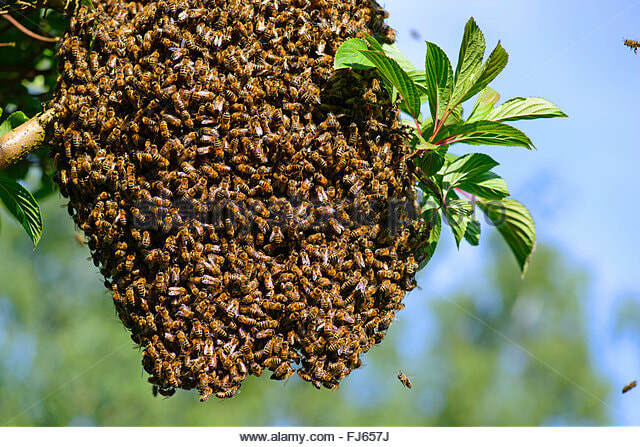 We're brainstorming ways to facilitate Shungite Beekeeping for those who are inclined to start their own beehives. Underdevelopment is a project to develop "Shungite Beehive Chapter Leaders" in each U.S. state to help facilitate the knowledge of how Shungite can help save the bees. 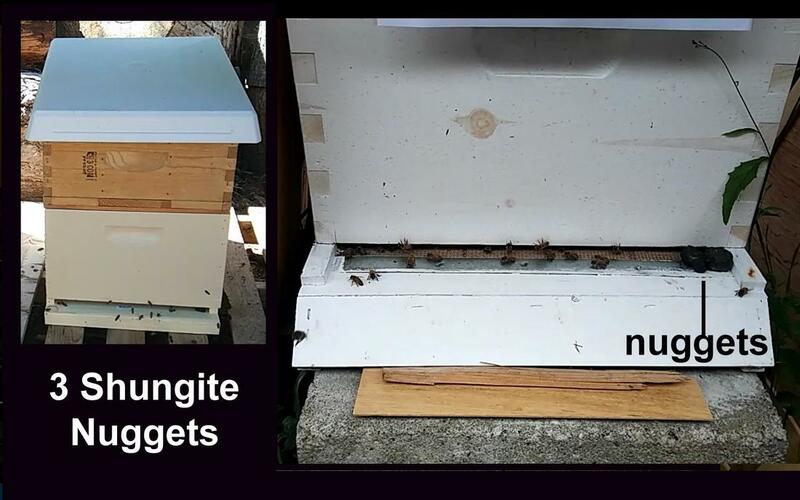 Three Shungite Nuggets were placed in the right-side entrance of two beehives. 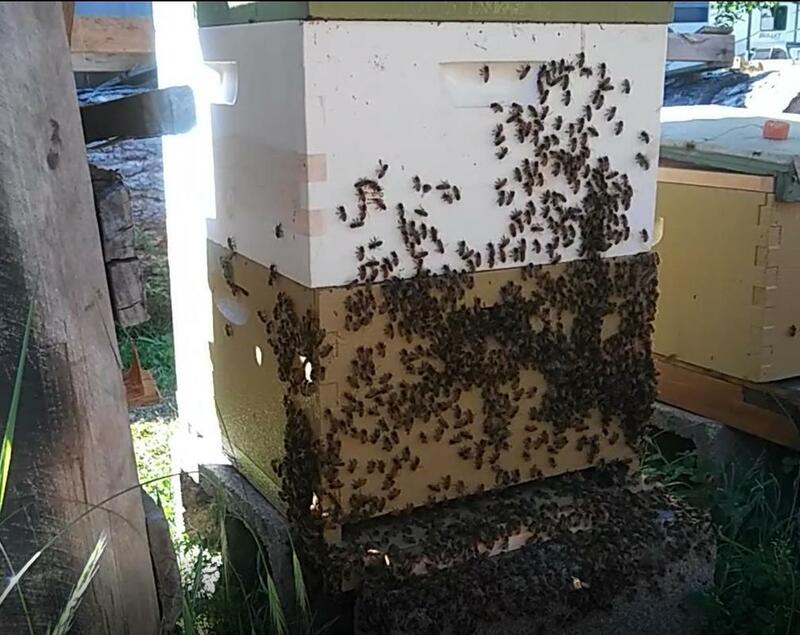 I noticed both hives beginning to crowd, regardless that there was an empty box with empty frames on top of the brood box (so there was room for expansion). I found both hives making queen bee cells, so I evenly split the various types of frames that the hives already had into 4 new hives to include new empty frames. The 2 starting hives are now a total of 6 hives all receiving a queen or queen cell from the two original hives. It was appx 3 weeks after receiving the nuggets hive #1 produced queens. It takes around 3 weeks for a queen to be produced, so it appears that the queens were began appx the time the nuggets were introduced. Shungite Powder was placed in 2 small plastic trays with .75g in each, at the entrance of beehive #1 only. Appx 2-3hrs 90% powder was carried away by the bees (or carried inside the hive). This Shungite Powder hive, of which there has always only been 1 to receive the powder, is the very beehive that I am having trouble keeping up with, always wanting to make queens. Approximately 3 weeks after Shungite Powder was introduced to hive #1 was when I found #1 hive producing more queens. 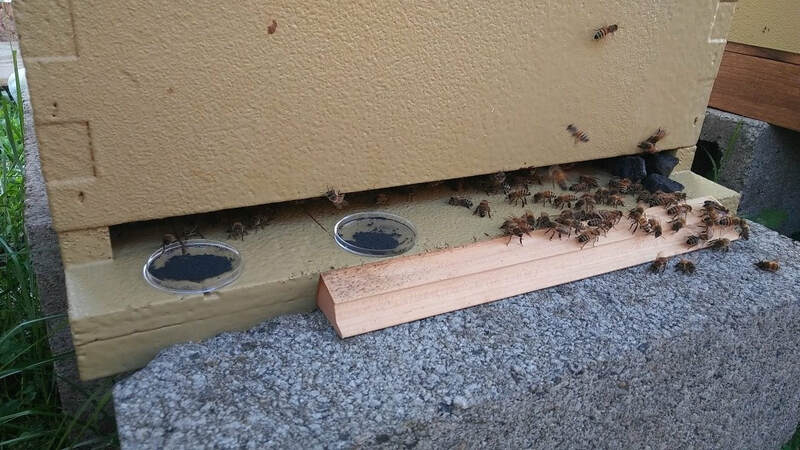 This time they swarmed, which I caught and placed into an empty hive. Now we total 6 beehives, all of which now have the 3 medium sized Shungite nuggets at their entrance, and we’re observing. Still unknown if all the queens remained with the new hives, waiting a couple weeks for them to try and start producing brood/honey. 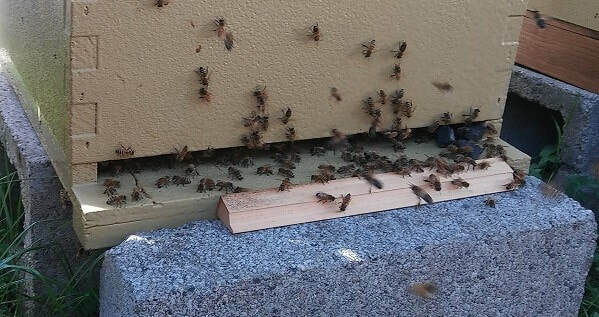 Because all the beehives were split up, it will take some time for them to build back up to full colony size and produce honey, providing the queens survived, remained & are healthy. I’ll continue to monitor and update. 07/11/17 - We currently have 6 new beehive being custom built, that we will try out the new Shungite Paint on. We’re trying to stay ahead of all the queens being produced by adding these additional beehives. Then we’ll use these Shungite Painted beehives as Queen rearing boxes. We’ll let the bees make the new Shungite Queen Bees in them for possible distribution next spring. This way we can get the Shungite Queens as widespread as possible. DISCLAIMER: Cosmic Reality LLC is facilitating this research project and making no claims as to the benefit of Shungite on bees. All information provided regarding our Shungite is considered “anecdotal” at this time. It is an ongoing process of research and it is only with your participation that we can determine if Shungite is beneficial for bees.